My cat, Peanut, likes to eat things that aren’t food. Things like iPod earbud wires, computer cables, video game controller wires, yarn, fabric belts that go with shirts, elastic that I was about to sew with and also (the reason why Peanut is not allowed to go into the bedroom closet) tassels on my scarves. I knew she had eaten off the fringe on a few of my scarves but it wasn’t until I was wearing this scarf that I witnessed her damage. Ugh! Cat, why do you do this to me!? Now that my perfectly good scarf has been mangled I decided to make lemonade out of lemons and turn this plain scarf into an infinity scarf. I’ve also heard it called a circle scarf. It is basically a scarf sewn in a loop which I really like because you never have to worry about adjusting the ends of the scarf while you wear it. You can do this with any scarf, even if your pet hasn’t destroyed it. If the scarf has fringe simply cut it off both ends. You can even make the scarf shorter now if you want. I used a serger so I just paired up my raw ends and pinned. Make sure the fabric isn’t twisted! If you are using a regular sewing machine you could match the ends up and roll them over a couple times to hide the edge and stitch over the roll like you’re making a hem. My scarf is woven but if you are doing this with a knit or crocheted scarf you might want to find similar yarn and hand stitch the scarf ends together. 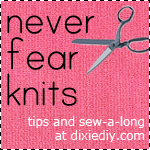 You also probably wouldn’t want to cut the ends as the scarf might unravel. This is my finished serged seam with the ends strings weaved back into the stitches and trimmed, a nice alternative to tying a knot and cutting the end. Ta-da! An easy fix to an unfortunate situation. Take that, cat!